Designer Lindsay Chambers founded her interior design firm in 2012. 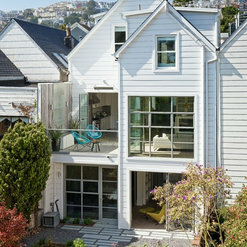 Chambers is known for her signature transitional style and putting a clean modern spin on traditional design concepts. Most recently, USA Today called her one of "today's most talented designers." Her work has been featured in Architectural Digest, House Beautiful, The New York Times, and the San Francisco Chronicle, amongst others. Lindsay truly has an eye for functionality and aesthetic. Upon the purchase of our new home, we were overwhelmed with the work and construction ahead, let alone designing and decorating once complete. Lindsay brought to the table a variety of options that provided our growing family with functionally without taking away luxury and beautifully flowing design. We are beyond thrilled with the items selected, and know that they are unique and personalized to our home. Lindsay and her team are exceptional and we feel so fortunate to have had her as a part of our home design! I have worked on several home remodels with Lindsay Chambers of Hazel.Wood Design Group over the last several years and I highly value the working relationship we and her team have established. In the homes I have built for Lindsay, her designs have incorporated the uniqueness and individuality of each home and it’s neighborhood with a modern, clean look and feel. She works closely with local architects to restore historical homes in San Francisco, Palo Alto and the greater bay area, breathing life back into the spaces and allowing for them to stand amongst California’s ever changing urban landscapes. Lindsay applies the greatest level of attention to each aspect of the build from lighting and plumbing fixtures to material selection such as counter-tops and custom cabinetry, producing a finished product that ensures a beautifully designed and functional space. I have enjoyed working with Lindsay Chambers and welcome the opportunity to continue building with her in the future. - Kyle Mortz Owner and president of Art Of Construction, inc.
WOW what an experience and result! Ms. Chambers saved me an insane amount of time. She provided various options for me to chose from, I would chose and the end result is awesome and my wife is even happier than I am (which makes me look good). Her taste is amazing, value proposition is unbeatable and she is so much fun to work and communicate with. I HIGHLY recommend her to all!! I wanted a modern, yet comfortable home, and Hazel.Wood did that in a way that catered to my sensibilities without letting me color outside the lines -- exactly what I wanted in the firm I hired. Lindsay Chambers innately understood my sense of style and was a confident guide through the entire process until I achieved the home I wanted. Hazel.Wood is a smart design firm that is razor-focused in getting the job done efficiently and in a cost-effective manner. Lindsay helped redesign most of my home. Besides making my house look great, she came up with some fun creative ideas (like a nano wall!). She's also fun and easy to work with! Highly recommend! Commented: Love this! !Is the floor tile marble or porcelain? mfr, pattern, color?It's marble. Commented: Can you tell me about the wall application? Wood composite? Mfr?Its paint grade poplar. Commented: Where did the gold bathroom hardware come from?Waterworks. Commented: Wall materialpainted wood planks. 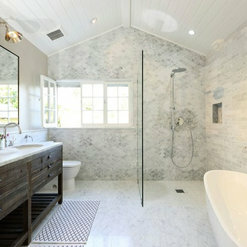 Commented: Bathroom MirrorsYes, they are from Restoration Hardware. Commented: Backsplash - make / model?Calacatta Marble subway tiles.